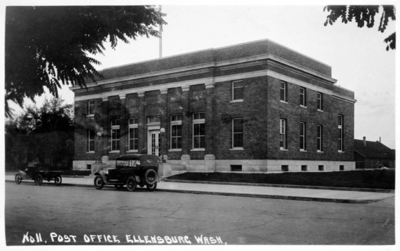 "Ellensburg Federal Building and Post Office"
Construction began on the new Ellensburg Federal Building and Post Office in early February 1916. The United States Treasury Department awarded the construction contract to Thomas E. Young of Seattle for $53,916. James A Wetmore was the acting supervisory architect. The building, located on the southwest corner of Fourth and Ruby Streets, was built about 60 x 74 feet, one story high, built of brick and trimmed with limestone. After many months of construction problems, the post office was completed in late winter of 1917. In the spring of 1917, Postmaster Robert A. Turner moved into the new quarters. During the 1950s, in addition to the post office, the U. S. Department of Agriculture Farmer's Home Administration was located in the building. In the spring of 1963, the post office was moved and the Ellensburg School District used the building for administrative offices.Postcard titled "Post Office Ellensburg, Was. No.11"
"Ellensburg Federal Building and Post Office" (1918). Ellensburg History Photographs. 73.